I live 65 years without knowing that some butterflies have ears, and now this week I encounter that fact twice. Here's the photo and text via animals, animals, animals. I'll do the other one later (it's buried higher in the bookmarks). Cracker butterflies (also called Calico butterflies) are a neotropical group of medium-sized brush-footed butterfly species commonly found throughout South America to Arizona... They acquired their common name due to the unusual way that males produce a “cracking” sound as part of their territorial displays. In the field, Hamadryas emit audible clicks when approached by potential predators, to defend territories from other Hamadryas and in at least one species also during courtship. 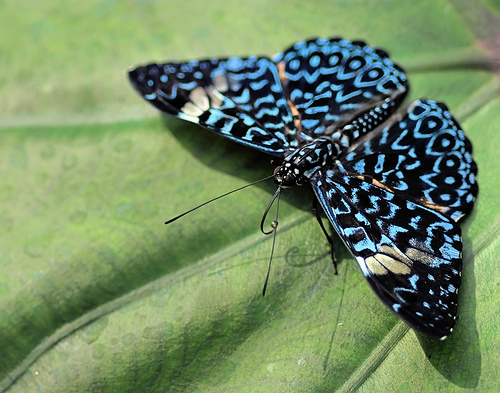 More than 50 species of lepidopterans (11 families) emit sound audible to humans. In general, lepidopteran sound is used basically as a warning to predators and for intraspecific communication. Research has shown that cracker butterflies can also detect the sounds made by other butterflies, which would be a form of social communication. The organ of hearing is believed by some to be Vogel’s organ, located at the base of the forewing subcostal and cubital veins. However, they may actually have a larger hearing organ for lower sound wave frequencies.